East Bengal breezed past Mohun Bagan in a high voltage ‘Kolkata Derby’ by a 2-0 margin on Sunday evening to complete a ‘Derby Double’ for the first time in 15 years and the first time ever in the I-League era. Jaime Santos Colado and Jobby Justin scored in either half to ensure that the ‘red and gold brigade’ stay in the hunt for their maiden I-League title. Man of the match Jobby Justin had a remarkable game, scoring once and providing an assist. 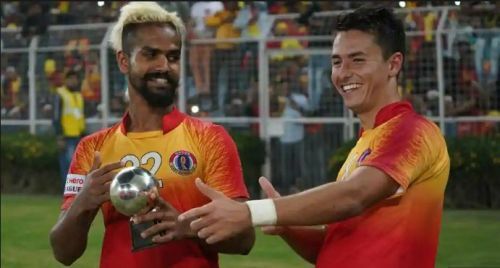 East Bengal coach Alejandro Menendez heaped words of praise on the young striker and said that he is growing as a player in every game. “I think that Jobby is progressing with every match. It’s not only because he’s scoring, but he’s also working on his complete game,” said the coach during the post-match press conference. He added, “He’s playing very well in the box, outside the box and in the middle as well. Right now, he’s a more complete player than he was last season and if he continues to play like this, he’ll deserve to play in the national team.” Jobby Justin is currently the third highest scorer in the I-League with 8 strikes, behind Willis Plaza and Pedro Manzi. On the other hand, Mohun Bagan’s title hopes are practically over, they can hope for a top-five finish if they manage to collect enough points from the rest of their matches. Bagan’s coach Khalid Jamil stressed the fact that his players tried their best and he himself took the blame for the loss to East Bengal at the Salt Lake Stadium. The former I-League winning coach feels that Mohun Bagan’s marking was poor, which was one of the reasons for the disastrous outcome of the match. “The whole team made a mistake in the goals. The marking was poor and the players couldn’t stop them from causing problems,” said the coach. The ‘Mariners’ remain at the sixth position with 21 points from 14 matches. On the other hand, their arch-rivals are in the fourth spot with 25 points from 25 matches. East Bengal is scheduled to play NEROCA FC at their home ground on February 7, while Mohun Bagan will host Gokulam Kerala FC in the same venue on January 30.